Your roof is your home’s primary protection from all the elements. As such, you want to make sure that you carefully consider whatever kind of roofing you want to have installed. One kind you might want to look at are slate roof tiles. Slate roofs are a very old and popular kind of roofing. The tiles are typically made of stone and are known for their longevity and elegant appearance. Here’s a list of the advantages and disadvantages of slate roofing so you better make an informed decision. Slate roofs have many different advantages. These don’t become one the most installed kind of roofing for nothing. Slate roofs are sought after because of the beauty and elegance that they provide to a home. The beautiful stone surface makes your house look sophisticated and immediately adds curb appeal. You also have a wide array of colors to choose from depending on the theme of your home. Not only are they appealing to look at, but they are also extremely strong and durable. This kind of material can last for several hundreds of years with only minimal damage. Slate roof tiles do not need much cleaning or maintenance. They do not easily gather dirt or dust and just need a water and a bit of brushing to make them look new again. These tiles have a very low water absorption index, making the materials basically waterproof. Because of this, damage due to water or leaking is very rare. It is also resistant to frost damage as well as to fire. Natural stone does not absorb heat or cold, making it truly energy efficient. It acts as insulation and can lower your home’s energy costs. Although slate roofs have a lot of benefits, it is not without its disadvantages. 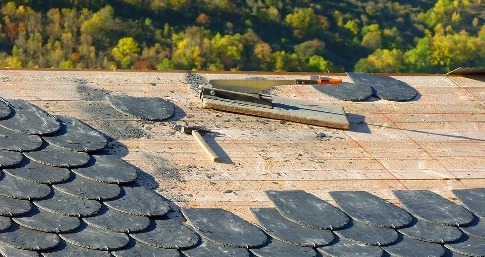 One of the more apparent disadvantages of slate roofs are the initial costs. Each square installed can cost you up to thousands of dollars. Be that as it may, while it is very expensive upon installation, it makes up with its easy maintenance and energy efficiency. In order to make sure your slate roof tiles are installed beautifully, you need to find a reputable contractor, which again costs you more. These tiles may vary in thickness and are very heavy, making it difficult to install onto roofs. Because of the weight, roofs must also be reinforced to make them strong enough to carry the tiles. Need more advice? Your trusted roofing specialist will be happy to give you some recommendations!